Between the big Windows Phone 8 releases last week and the Nexus 4 this week, there will a lot of consumers flocking to stores this holiday season. Not us since we are all locked in contracts, but others will. Over the next few days we will attempt to profile a new mobile device that deserves your money. 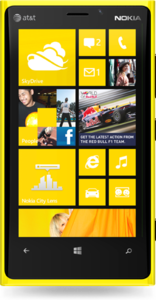 Up today is the Nokia Lumia 920! As a current user of the Lumia 900, I am excited for the 920. With an awesome camera sensor, dulal core Snapdragon processor, NFC and more, it's a big upgrade. The Lumia does seem like a great device. Since we don't have one in house, here is what the rest of the internet thinks about it. The Lumia 920 is the pinnacle of Nokia engineering. It has great build quality, filled with the latest technology and it also looks really good while doing it. We found nary any issues with the hardware and if you’re comfortable with Windows Phone 8, this phone is your best option…if you want the best. The PureView camera, while not perfect, gives outstanding night photos and shoots the best video of any phone on the market today. The plethora of Nokia software like GPS navigation only sweetens the deal. Nokia arguably offered up the best hardware for the last iteration of Windows Phone. Does it repeat that success here? Yes, but it ties with the HTC 8X for that honor. The Lumia 920 feels substantially chunkier, despite having similar by-the-number dimensions, but it remains another glorious piece of hardware from Nokia. That large shell has afforded more space for the latest PureView camera, which delivers superb low-light performance and effective optical stabilization across stills and video. While these features worked as well as we'd hoped, well-lit shots lacked the clarity and detail we saw during earlier test sessions. Overall, results were a little too smoothed out (and many smartphones have a tendency to over-sharpen), and fell short of our expectations for Nokia's latest PureView phone.